In America we have the Civil War battlefields and then there are the graves of the soldiers who died in the invasion of Normandy (where the interments are now computerized). In Cambodia you have the Killing Fields. 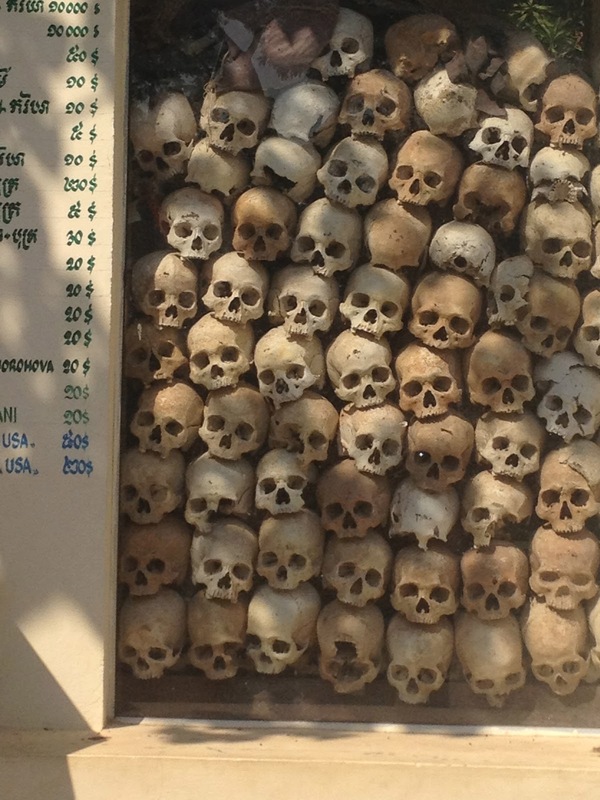 There are approximately 200 of them representing the 2 million Cambodians who died during Pol Pot’s reign of terror. Since bullets were being saved for more important things like fighting the Vietnamese who eventually defeated the Khmer Rouge, blunt instruments like axe heads were one of the major weapons of murder. Oftentimes the victims dug their own graves before being murdered. Pol Pot is not a real name. It’s shorthand for Politique potentielle and the politics of the region was one in which the embattled King Sihanouk first undertook a policy of appeasement towards the Vietcong and then went on to provide the very name, Khmer Rouge, for extremists who would unseat him. When they invaded Phnom Penh, they placed him under house arrest and marched the population out to the countryside, supposedly to protect them from the impending American bombing. Most never returned. In Siem Reap, a Buddhist Temple, Wat Thmei, memorializes the killing field that was discovered by a rice farmer in the l990’s.